R.C. Sproul and Abdul Saleeb Discuss Islamic Theology in "The Cross and the Crescent"
What are the differences between Christianity and Islam? In today’s culture, the distinctions have been obscured. For the past week and a half, R.C. 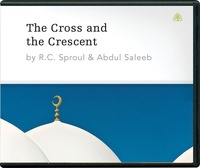 Sproul and former Muslim Abdul Saleeb have been going through the teaching series The Cross and the Crescent on Renewing Your Mind. In this investigative series, Drs. Sproul and Saleeb demonstrate how Christianity stands in stark contrast to the claims of Islam and discuss the differences between Christian and Islamic theology.